A skydiving simulator, known also as the vertical wind tunnel or free fall simulator, will give you the feeling of a real skydiving experience while staying safely on the ground. Some love the wind tunnel just for what it is and others use it mostly as a training space before their real jump, but everyone has a great time when the strong, 280 km/h (174 mph) fast wind stream lifts them up in the air. 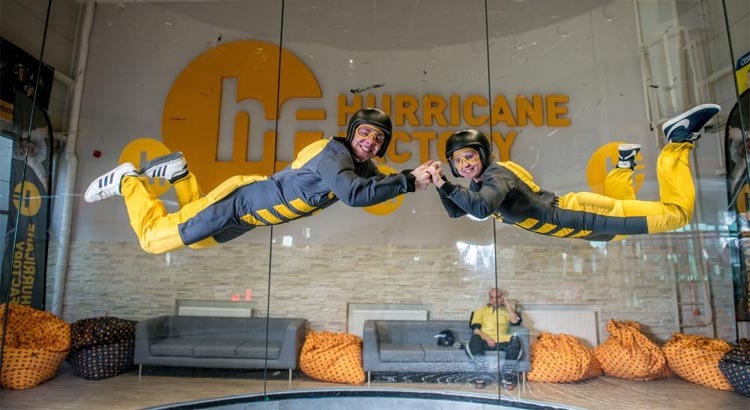 The wind tunnel is 4.3 meters wide, which makes it a fun activity for couples who can free fall together and maybe practice some advanced formations. Experienced skydivers will give you tips on how to achieve popular tricks, and maybe they will even inspire you to do the real thing. They can also record your technique on video if you wish and give you additional feedback on how to improve without wasting too much energy. The price is €71 per person for a 3-minute free fall, and includes an English speaking professional instructor and gear. Before the flight, you will get a detailed briefing from qualified instructors. You will be loaned protective equipment: overalls, helmet, goggles, and gloves. After this briefing, you will get to the flight chamber. This chamber is closed, so there is no falling out of the air stream, and the whole time you’re under the supervision of an experienced instructor. In a short time you will learn how to control your body in a wind stream and use 3D motion options. The enter periods are recommended after 1.5 min because of the physical demands of the discipline. After the flight you can check the record of free fall simulation, which you can analyse together with the instructor. General conditions: This activity is suitable for men, women and children from 5 years of age who want to experience weightlessness. Persons under 18 years need the consent of a parent. It’s not suitable for pregnant women, people with impaired blood circulation and heart issues, or people with back problems, hotplates, and other injuries. A good physical condition is required, and the activity is designed for one person and instructor in the tunnel. Viewers may be present and can take pictures and videos. Duration: The total time of the experience is 1.5 hours. The first hour is reserved for briefing and getting ready, then you enter the wind tunnel for 3 minutes, or alternatively for two periods of 1.5 minutes. Dress recommendations: We recommend comfortable clothing under the suit and lace-up boots. You will be given the appropriate gear, including suit, helmet, goggles, and gloves. OUR TIP The location is quite far from the city center and difficult to reach using public transport. We recommend getting there for free using an Uber taxi. It’s possible 3 persons – friday 22.06.2018 at 18:00/19:00 ? Price is 71€ all include, correct ? can we pay there?